While the phrase “chain restaurant” may bring to mind images of congealed food served in a dark, pungent mall basement, in New York City, our local chains are actually great -- and certainly worthy of national attention. From meatballs done a million ways, to BBQ brisket with inventive sides, to Cambodian sandwiches, there are tons of mini-chains in NYC that have broken down boundaries of what it means to be a chain -- and they’d do just as well on a national stage. To the rest of the country: this is what you’re missing. Why it's great: In a city full of excellent Chinese food, Xi’an Famous Foods still manages to stand out. With dishes that stick close to its Northwest Chinese roots, Xi’an offers an uncommon (in these parts, anyway) blend of Chinese and Middle Eastern flavors, notable for the use of cumin, chili, and Sichuan peppercorns -- think dishes like lamb offal soup, stewed pork burgers, and hand-ripped noodles in stewed oxtail. From its humble beginnings in a Queens food mall to its current position as arguably the best option for cheap late-night dining in several neighborhoods across the city, it’s not only an NYC success story, but a clear contender for national chain recognition. That's seen in the fact that it remains totally uncorrupted by pretense or high prices, even in the wake of visits from his holiness Anthony Bourdain. 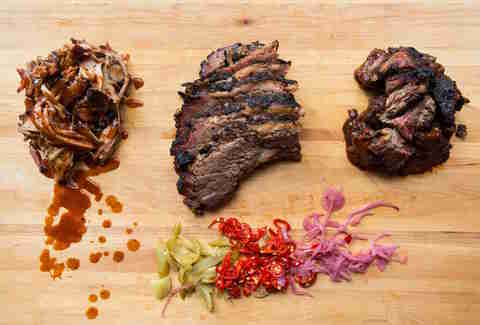 Why it’s great: For a city as far from the Mason-Dixon as New York, the market for quality barbecue is crowded indeed. Mini-chain Mighty Quinn’s holds its place admirably, though, with heaping trays of slow-cooked brisket, pulled pork, and the terrifyingly large Brontosaurus rib, which, if not from an actual dinosaur, is at least large enough to act as a weapon if you’re ever attacked by one. Unlike spots found in North Carolina or Texas, Mighty Quinn’s borrows from the BBQ traditions of multiple regions, all coming together to create its own style. In addition to the meats, it’s also known for its inventive sides, which are well worth mustering the room for: the sweet corn fritters with honey chile dipping sauce, and the “dirty frites” -- fries smothered with burnt-end beans and chile-lime sauce -- are several cuts above the standard, uninspired coleslaw and mac & cheese. 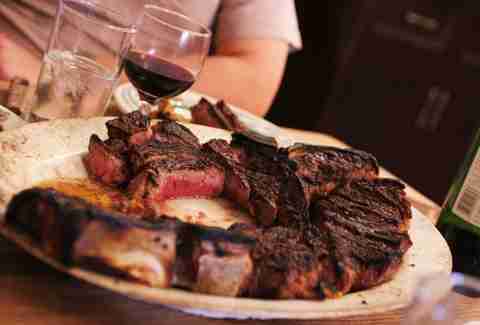 Why it’s great: You know Peter Luger by its original, deeply old-school Williamsburg location, but did you know that there’s also a sister outpost in Great Neck, Long Island? Before you huff and puff about Great Neck not being in NYC, know that the town is literally a street away from northeast Queens, so it’s not unreasonable that you could hop across the border for some of the best beef around. Both locations offer classic Teutonic interiors; surly, sharply dressed waiters; and, of course, that USDA Prime, in-house dry-aged porterhouse. You’re allowed to have your steak cooked any way you want, so long as the way you want is medium rare, or better yet, rare. The rest of the country deserves to know what it’s like to watch a charmingly cranky waiter load perfectly cooked, melt-in-your-mouth meat onto your plate. Why it's great: As a seasoned New Yorker, you probably don’t even remember the days when your best option for a meatball sub was Subway. 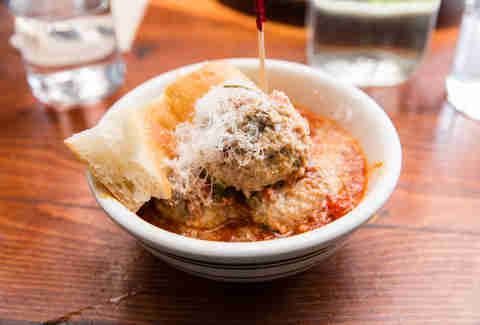 This city specializes in the quality execution of lowbrow foods, and The Meatball Shop sets the standard. From its simple yet clever menu -- which begins with “Naked Balls” and offers a variety of sauce options (did you want those balls covered with Parmesan cream or mushroom gravy? ), as well as several ways to consume said balls (on a hero? Over greens? As a slider? Topped with a fried egg? ), The Shop takes your favorite Sunday night dinner at Grandma's and makes it accessible, cheap, and fun. And because this is New York, sides include such decidedly un-down-home options as daily roasted veggies and steamed spinach. The rest of the country deserves meatballs done every way you could possibly want them. Why it’s great: When God invented sandwiches (on the seventh day, when he was supposed to be sleeping), they looked identical in shape and form to those offered at Court Street Grocers. From its original location on, you guessed it, Court St, two other outposts have sprung: A closet-like Hero Shop in Red Hook, and a much roomier restaurant in Greenwich Village. But fluctuations in the interior’s size have no effect on the quality of the food, which remains phenomenal thanks to straightforward, quality ingredients assembled in unique and innovative combinations. Aspiring professional eaters can enjoy a “Macho Man or Woman,” made of pork shoulder, cheddar, coleslaw, pickled jalapeño, and duck sauce on garlic bread. 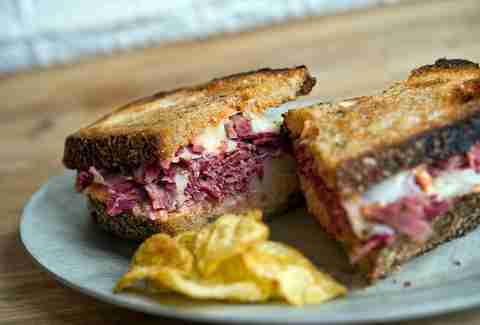 But vegetarians and those with lighter appetites won’t feel out of place either, with options like the Uncle Chucky (roasted turnips, pumpkin seed romesco, pickled fennel, red onion, and arugula) or the Broccoli Reuben, which swaps corned beef for roasted broccoli. Why it’s great: There are very few food departments in which NYC is lacking. But burritos are, to the horror of so many California transplants, one of those things. 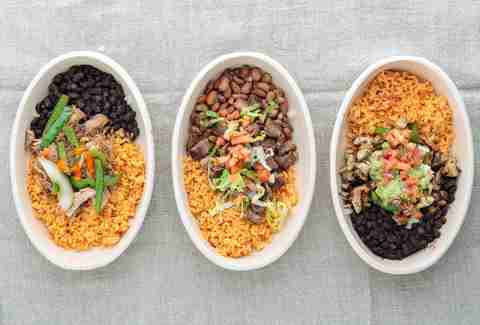 Take heart, West Coasters: Dos Toros is here for you. Started back in 2009 by two homesick Bay Area natives, the minichain is based on the much-revered Gordo, a Berkeley taqueria whose signature power move is melting a slice of cheese directly onto the tortilla. This technically makes Dos Toros a spinoff of a California chain, but no matter: juicy carnitas rolled into a burrito (or a taco, or dumped in a plato) are a revelation that everyone -- East Coasters, West Coasters, and residents of all the space in between -- deserves to enjoy regularly. Why it’s great: Doughnut Plant first opened on the Lower East Side in 2000, but its story goes back much further. 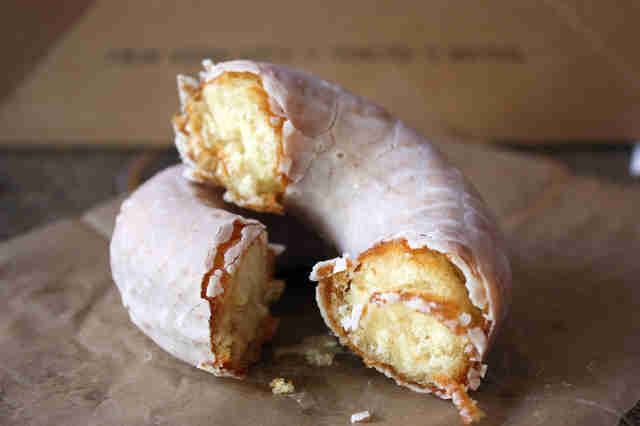 Mark Israel, who comes from a family of bakers, first began slinging donuts in the basement of a converted tenement in 1994, and things have only skyrocketed from there. After inventing the jelly-filled square doughnut and the inimitable blackout doughnut (a chocolate cake doughnut filled with chocolate pudding, dipped in chocolate glaze, and sprinkled with chocolate cake crumbs), Israel opened a second location in the historic Chelsea Hotel in 2011, then a third, then a fourth. In a nation blanketed by Dunkin’ Donuts, Doughnut Plant aspires to the ethos of the city itself: why eat something mass-produced and just OK when you can eat something great? Why it’s great: In the 1930s, a New York City deli worker named Constantine “Gus” Poulos went on vacation in Havana, Cuba, where he discovered the magic of tropical fruit drinks. Intent on bringing his discovery back to NYC, Poulos went on to open a juice bar. Then he opened another juice bar, then another. At some point, he decided to throw hot dogs on the menu -- because what better comestible to wash down a sticky fruit drink than a piece of processed meat compressed into a tube and wedged in a bun? With that, Papaya King was born. Together, the juice-dog combo forms one of the most iconic meals an aspiring New Yorker can order -- locally sourced dogs made with a secret spice, washed down with something sweet. Papaya King’s Original Combo -- two franks with ‘kraut, onions, or relish, and a drink -- is still the ultimate late-night meal in New York. Hot dogs became big business in the city, and in the 1970s, a rival named Nicholas Gray went on to open his own slightly modified version of the wildly popular stand, called Gray’s Papaya. Though these two have long been the main contenders, other offshoots were born, including Papaya Dog and Mike’s Papaya. While Gray’s and Papaya King in particular have enjoyed a vicious rivalry over the years, it seems King has the throne, after all: the city is down to just one Gray’s. 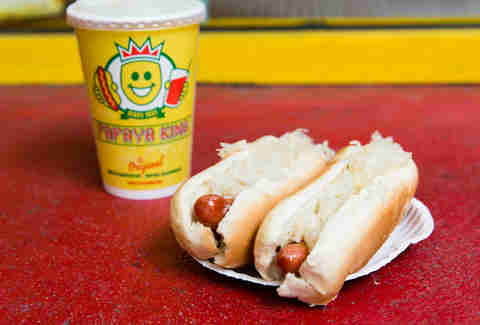 Papaya King, on the other hand, is still going strong, with its fifth location having just opened in Brooklyn. Why it’s great: It’s pretty obvious why the rest of the country needs Num Pang: how many Cambodian sandwich shops do you have, Cleveland? 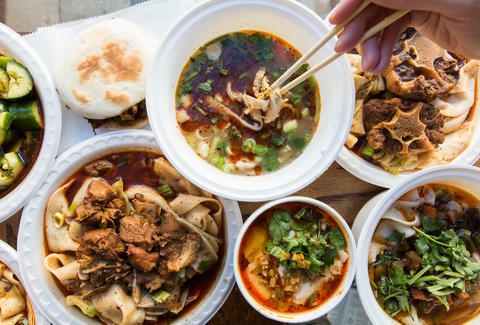 Num Pang distinguishes itself by having locations in areas of town largely considered culinarily desolate: FiDi, NoMad, Times Square, Union Square. If you find yourself hungry in one of these neighborhoods, you don’t have to resort to a deli steam table or an overpriced tourist burger. Num Pang offers reasonably priced dishes made interesting by complementary flavors, like a pork belly sandwich with sliced pear and hoisin meatballs, topped with jasmine rice, basil, and stewed tomatoes. You can enjoy it with a side of spicy organic tofu salad (in the summer) or a curried red lentil soup (in the winter). For office workers, there’s no better option for a filling meal that won’t put you to sleep as soon as you return to your desk. Why it’s great: Taïm may have just two locations -- one in Nolita, one in the West Village -- but it’s high Taïm (sorry not sorry) it expand elsewhere. 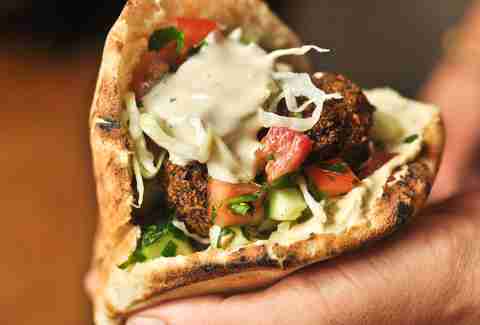 Falafel shops are a dime a dozen in New York, but almost none accomplish the feat of fried chickpeas with the quality of Taïm, which has been racking up accolades from food critics since 2006 for its moist, perfectly fried falafels. While those, of course, will always be the main attractions, they’re best consumed with warm and fluffy pita bread; a fresh, springy salad; and a refreshing date, lime, and banana smoothie. Lauren Evans is a freelance writer based in NYC. Follow her on Twitter at @laurenfaceevans.